Named “One to Watch” by CNN in 2015 as part of their international television series that shines a light on up-and-coming creative talent set to be the next big names in culture, modern pop artist Jordan Nickel (POSE) has been applauded for his inventive ability to take everyday, throw-away things and introduce them into the world to communicate something much deeper. While his work relies on harnessing very simple human emotions like love, loss and triumph, it’s presented in a complex union of vivid colors and layered application that aims for something much more profound than what’s at the literal, surface level. Having shown works at galleries spanning the globe – including Dubai, London, New York, Detroit and Los Angeles – his diversity as a visual artist is also apparent in grandiose outdoor settings on six different continents. 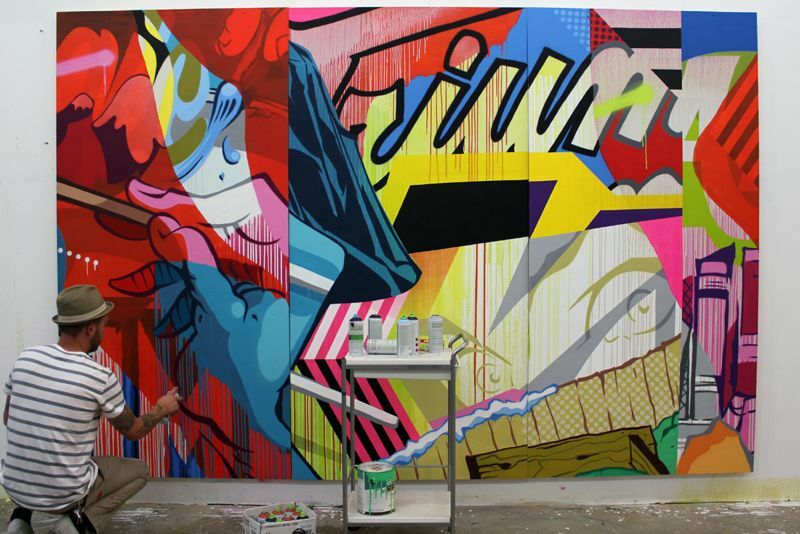 His aim to promote community engagement and outreach has received press from the likes of The New York Times, BBC News, Vanity Fair and Forbes – with notable examples including the Bowery/Houston wall in New York City, the Wynwood walls in Miami, and the exterior of the Museum of Contemporary Art in Detroit, where he and other artists championed visual expression to empower residents to beautify a neglected American city. “My artwork is pretty cut and dried,” POSE says. “I’m taking from the world around me – whether it be bits of signs or my wife’s old childhood books.” His attempt at making sense of the environment around him started with graffiti and has matured into a body of work with multiple dimensions and layers that are a pop blend of illustration, lettering and comic book aesthetics.